Deer Valley Unified School District: Desert Mountain SchoolPrincipal: Lynda Johnson PBIS has given our school common vocabulary and expectations. Prior to implementing PBIS our climate was inconsistent, negative, and not defined. Since Implementing PBIS our school climate has become more cohesive, positive and structured. Teachers have a clear knowledge of implementing positive interventions in classroom which have decreased office referrals and interruptions to instruction. Our schools implementation of PBIS has been so successful that it has been modeled by others schools in our district. 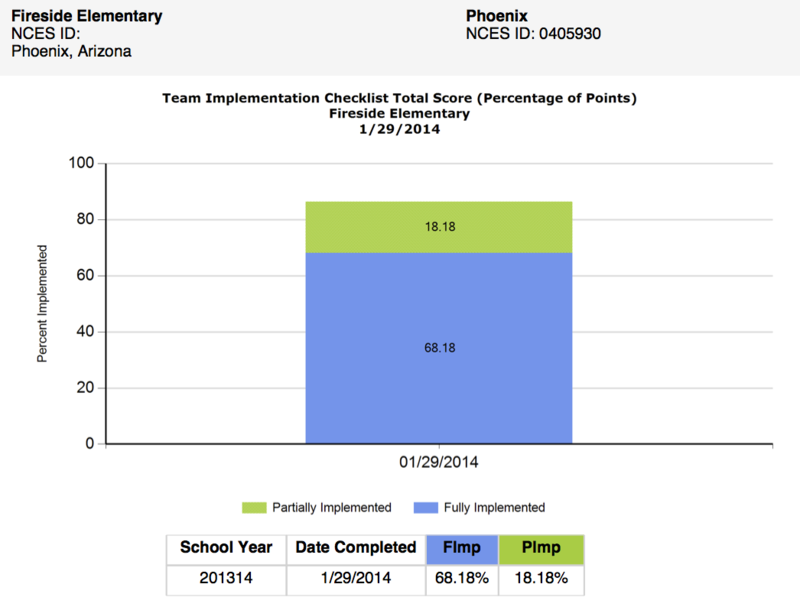 Laveen Elementary District: Trailside Point SchoolPrincipal: Sarah Zembruski PBIS implementation has positively transformed Trailside Point School. We are in our third year of implementing our Panther P.A.C.T. 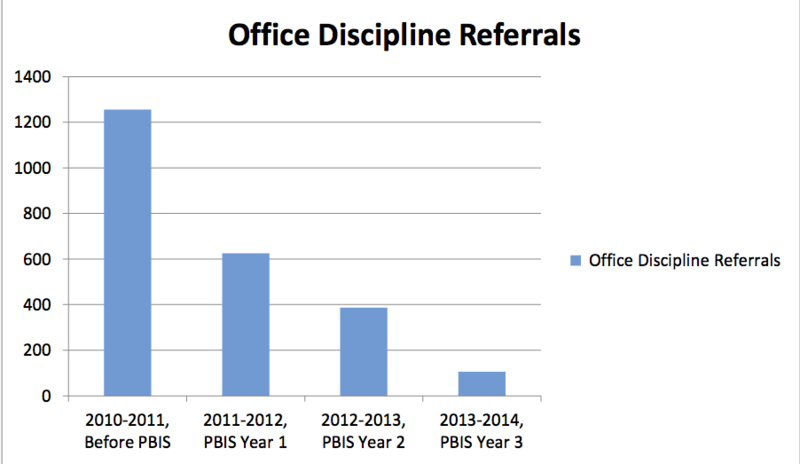 The year before PBIS implementation, Trailside had 1,256 office discipline referrals, in year one that number dropped to 625 office discipline referrals, in year two that number went to 387 discipline referrals, and in year three that number is currently at 106 discipline referrals half-way through the year. 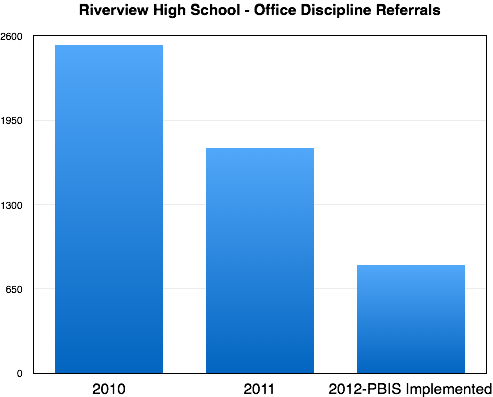 As the discipline incidents have gone down, the academic achievement has increased with the school improving from a ‘C’ school to a ‘B’ school. In the first two years, we focused on Tier 1 interventions as we defined what doing our Personal Best, being Accountable, being a Critical Thinker, and being Tolerant looked like in the different common areas of the school. We also implemented Panther Bucks and opened a Panther Store to reward students. This year, Trailside has concentrated on beginning Tier 2 and Tier 3 interventions for students. 43 staff members are doing check-in/check-out mentoring with students, developing point sheets after consulting pbisworld.com. Small group interventions have resulted in new groups such as a Bully Patrol trained to report and monitor anti-bullying, an Ambassadors and Classy Ladies groups for middle-school males and females, and 25 middle-school students who are doing weekly mentoring with Tier 3 K-2 students in the Panthers-Cubs program. Trailside Point is proud to have been designated a No Place For Hate School by the Anti-Defamation League of Arizona, one of only two schools in the state to receive such a distinction. Discipline data guides the PBIS team in selecting which tier and which intervention students should receive. The overall result has been a much safer campus with an extremely positive, student-focused culture. 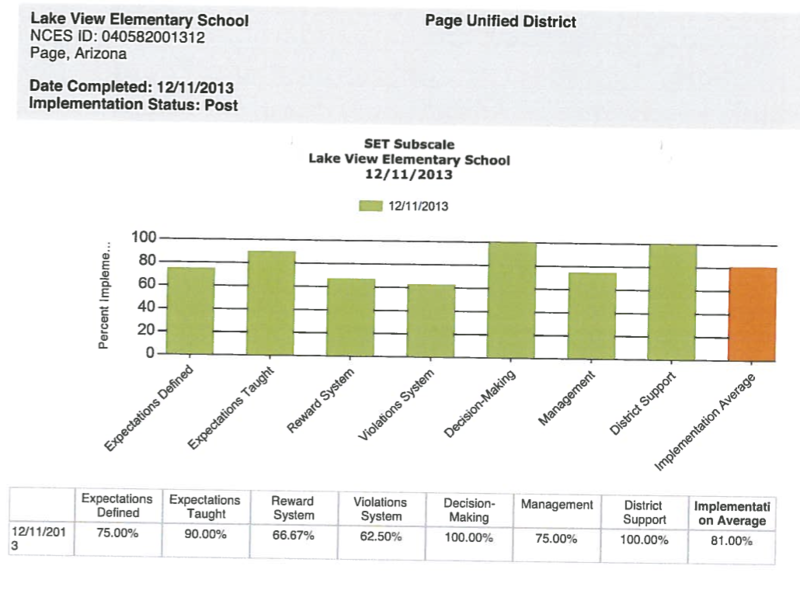 Page Unified School District: Lake View Primary SchoolPrincipal: Risha VanderWay Lake View Primary is in year 2 of Positive Behavior Intervention Systems. We have accomplished a lot in the last 2 years. 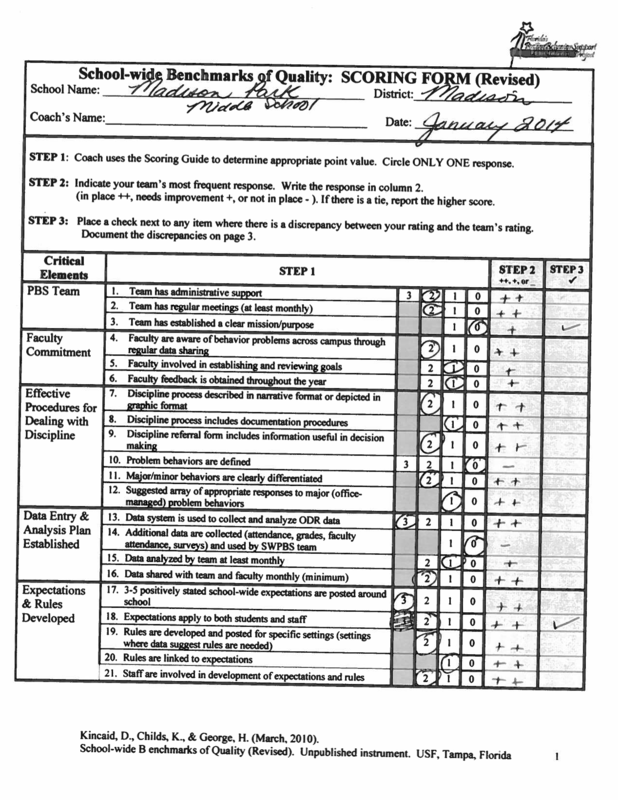 Students are taught the PRIDE matrix and the expectations of their behavior for the main areas at school for Tier I. This year we have started structuring the Tier II with Check in, check out used to help develop the behavior in our Tier II students. They need a little extra support to be successful. 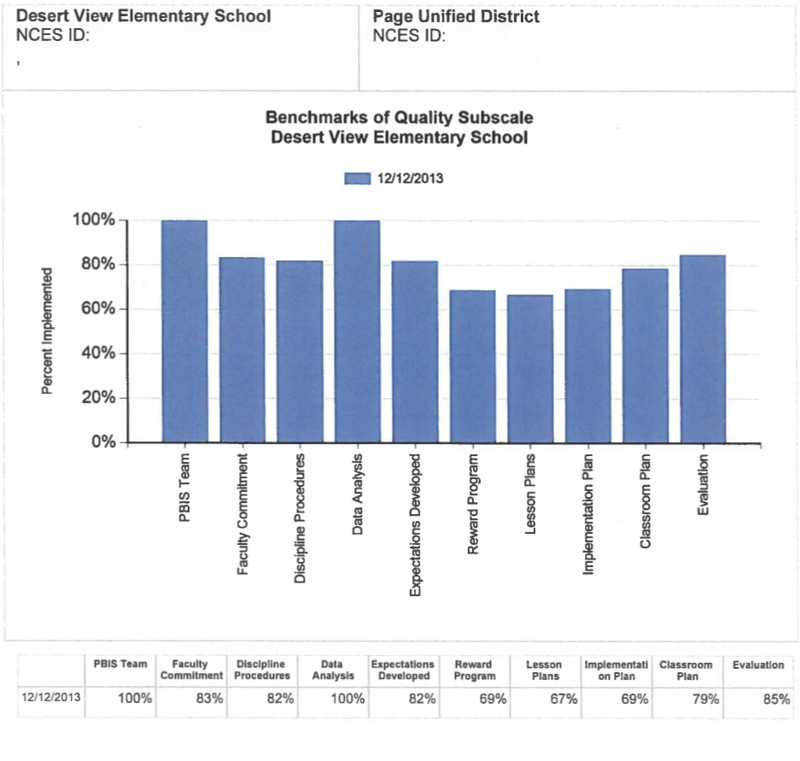 Page Unified School District: Desert View Elementary SchoolPrincipal: Robin Greywater Implementing the PBIS system into our school and district has impacted the school, staff, and students in a positive manner. 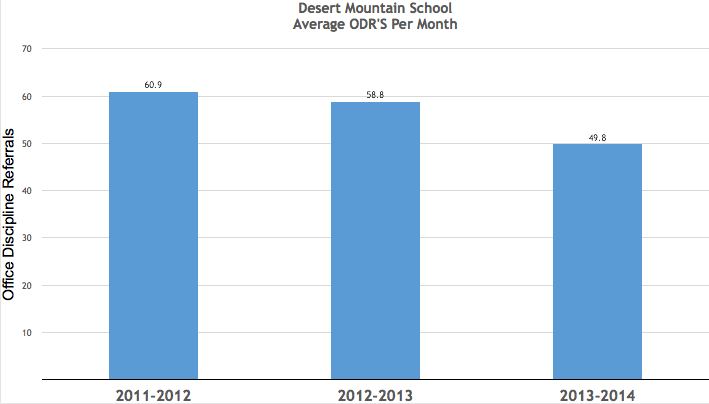 The staff at Desert View Intermediate is committed to the system and results of the last year show a decrease in the number of Office Discipline Referrals. 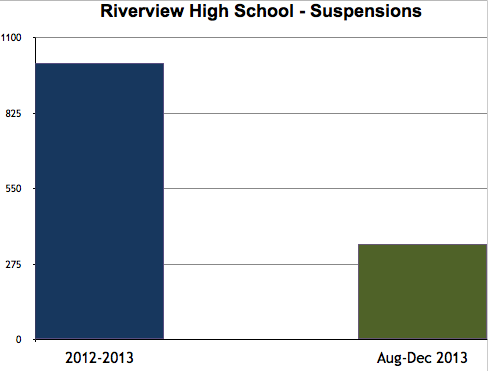 Over the past 5 months, the Office Discipline Referrals have been cut in half each month. 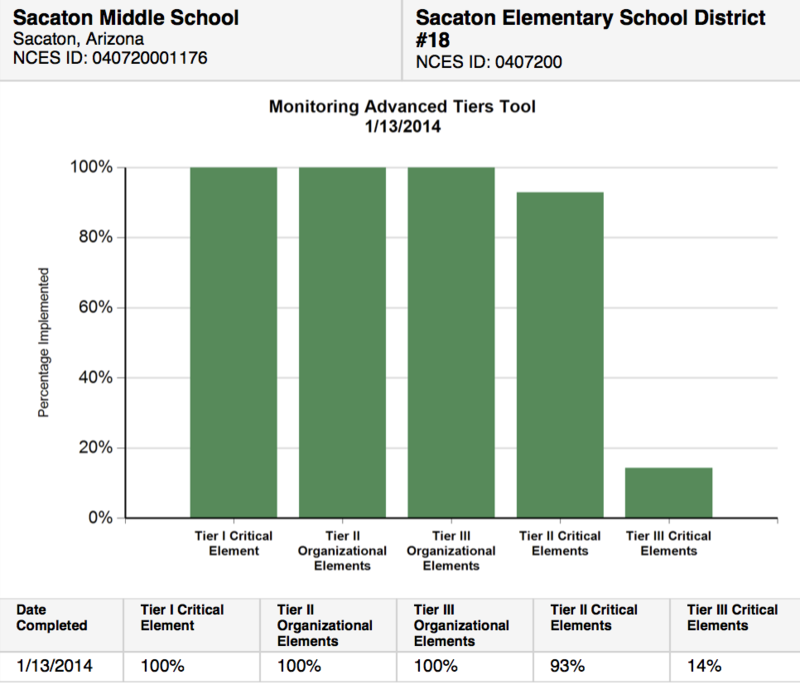 The system provided our school with clear expectations and a plan for addressing student needs and concerns through the Tier II and Tier III interventions. By addressing the students’ needs with specific interventions, we can pinpoint areas for improvement and provide needed support to increase academic growth for all students. Page Unified School District: Page Middle SchoolPrincipal: Christy Rodriguez Page Middle School continues to see a positive impact as a result of implementing PBIS. 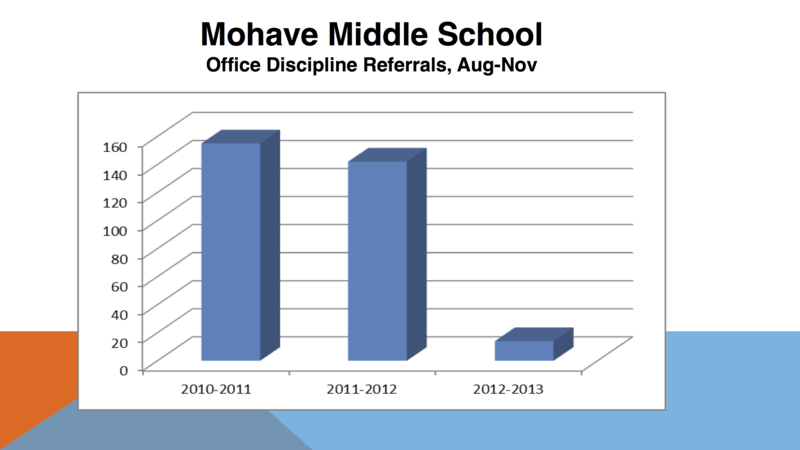 Overall we have seen a reduction in office discipline referrals since implementation. This current school year we are seeing a more drastic decline so far. Students are taught and reinforced for displaying their Panther PRIDE based on our school-wide expectations leading to a more positive school culture. As we continue our PBIS journey we look to continue to refine and build our Tier 2 and Tiers 3 behavioral intervention structures and responses to provide a clearer and more systematic response to students who need additional support. 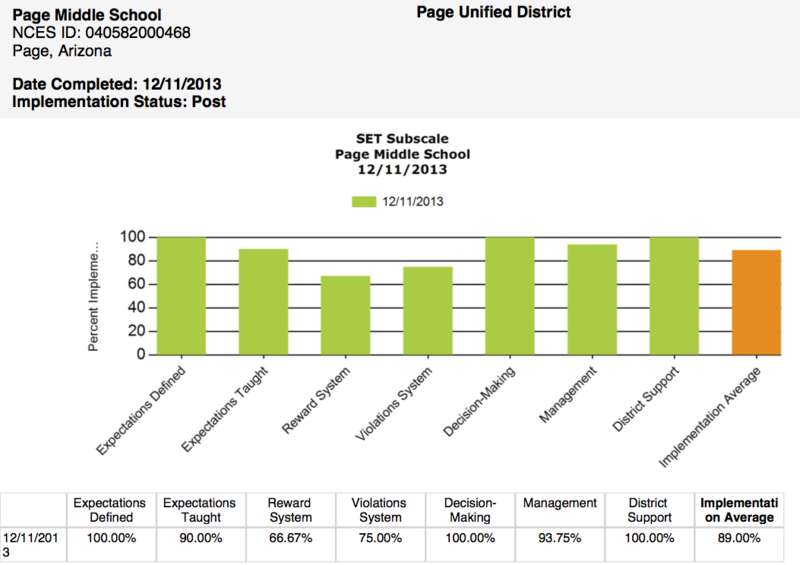 The implementation of PBIS at Page Middle School has created a more positive school climate and has decreased the number of behavior infractions. Page Unified School District: Page High SchoolPrincipal: Paul Gagnon PBIS has had immediate impact on Page High School with increased student attitude and interactions on campus and throughout the community. Our major incidents of drug use has decreased by 50% over the two years, alcohol by 28%, fighting by 50% as shown by referral data from August 1 – December 20 over three years. Total incidents have reduced 66% from two years ago and 39% over last year’s first semester data. We have reached out to community with Expectation Matrix posters, Page PRIDE Support Posters, and Business Version PRIDE Cards for business support of the positive reinforcement of behaviors. Businesses have requested more tickets and have given positive feedback on its effects (cleaning up after themselves, level of noise in establishments,and manners. Sacaton Elementary School District: Sacaton Middle SchoolPrincipal: Phillip Bonds PBIS has given our school common vocabulary and expectations. Prior to implementing PBIS our climate was inconsistent, negative, and not defined. Since Implementing PBIS our school climate has become more cohesive, positive and structured. Teachers have a clear knowledge of implementing positive interventions in classroom which have decreased office referrals and interruptions to instruction. 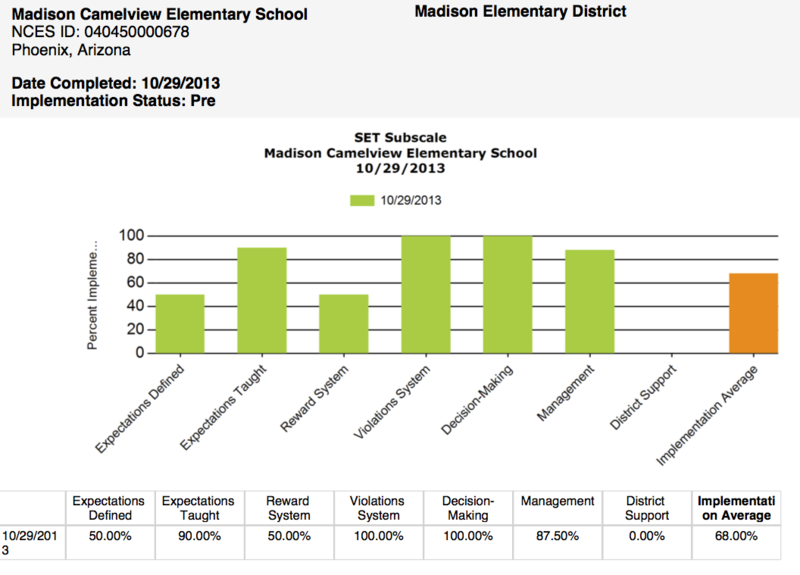 Our schools implementation of PBIS has been so successful that it has been modeled by others schools in our district. 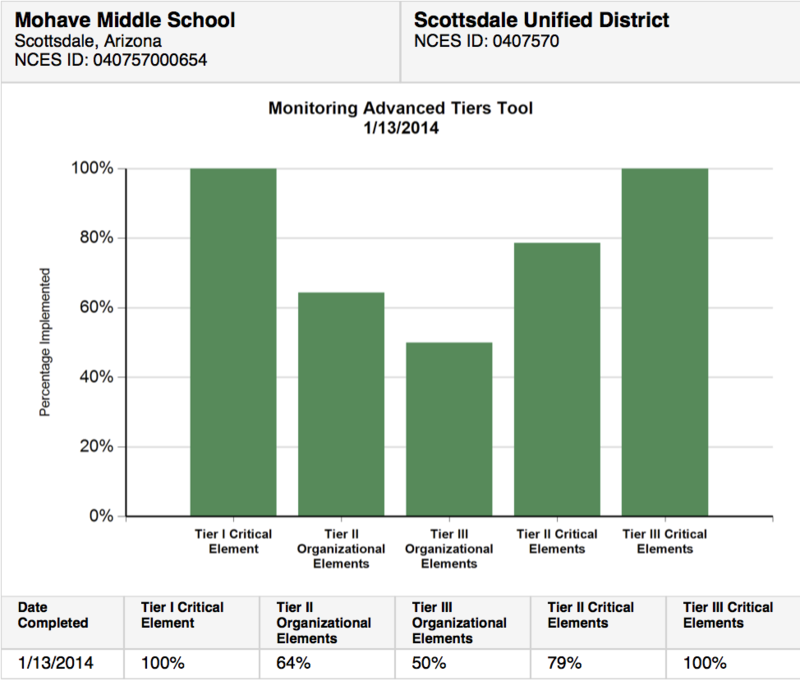 Scottsdale Unified School District: Mohave Middle SchoolPrincipal: Chris Asmussen Mohave Middle School has been implementing PBIS for over three years and it has impacted our school in several ways. There has been a decrease in our office referrals due to our staff regularly teaching students the school-wide behavioral expectations and reinforcing those expectations using the three steps; stating the expectations, stating the skills and giving the PAWS ticket! 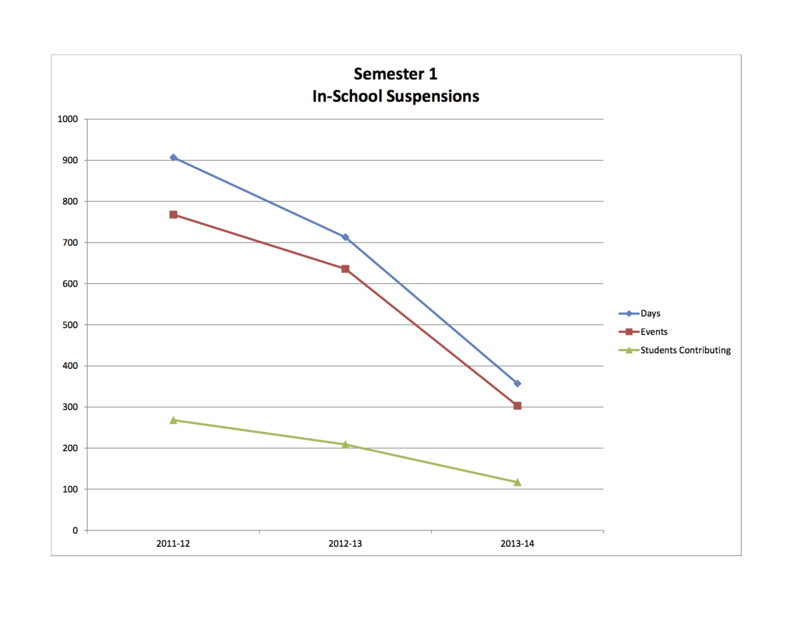 The decrease is also attributed to teachers understanding what infractions are classroom managed and what infractions are handled by administration using our discipline flow chart. 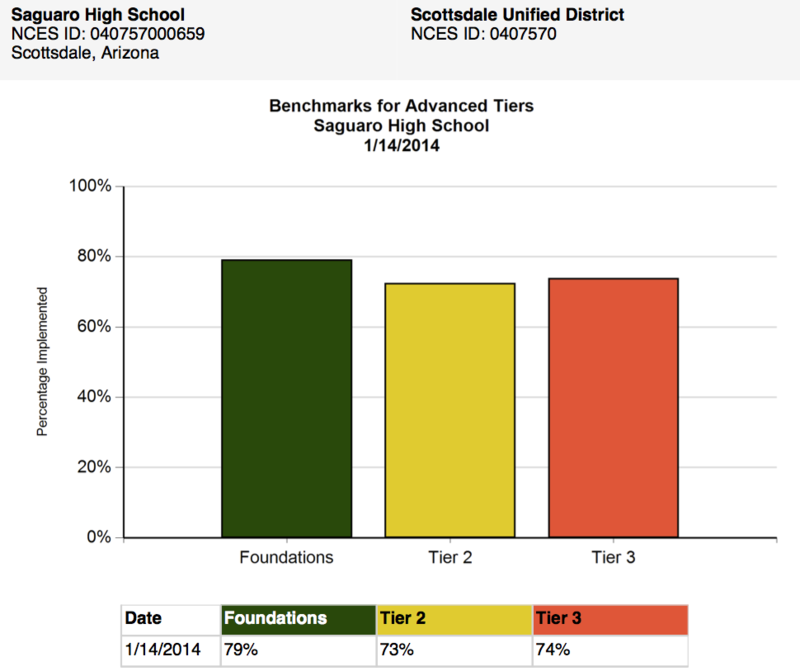 Scottsdale Unified School District: Saguaro High SchoolPrincipal: Brian Corte PBIS has provided Saguaro with the structure and tools necessary to create a safe and supportive school environment. 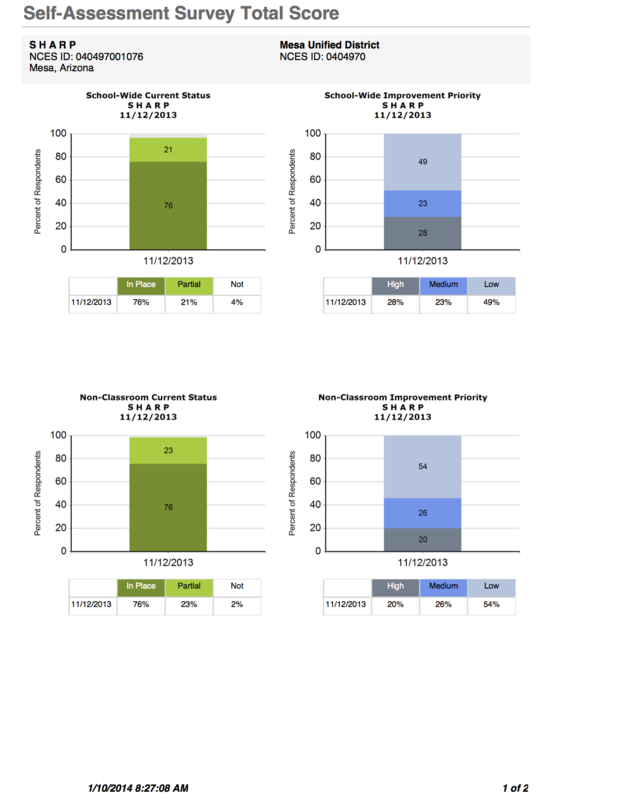 Suspension and office referral data has drastically decreased due to staff teaching and consistently recognizing our school-wide CATS expectations. Students understand what is expected and they are responding favorably to our CATS positive reinforcement system. Attitudes among staff, parents, and students are positive as evidenced by community feedback and an increase in our school climate score. These positive attitudes have created an environment for success. 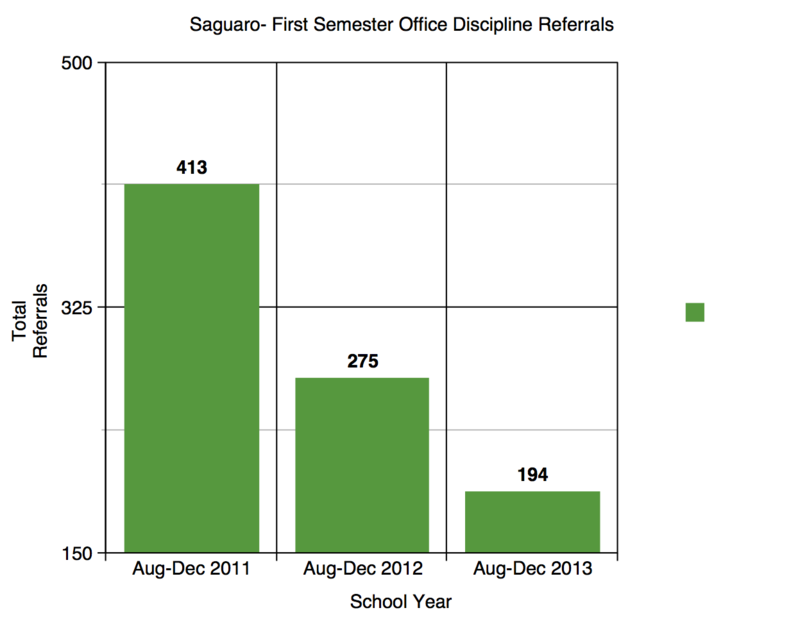 We are excited about the positive impact PBIS has made at Saguaro and we look forward to another great year! 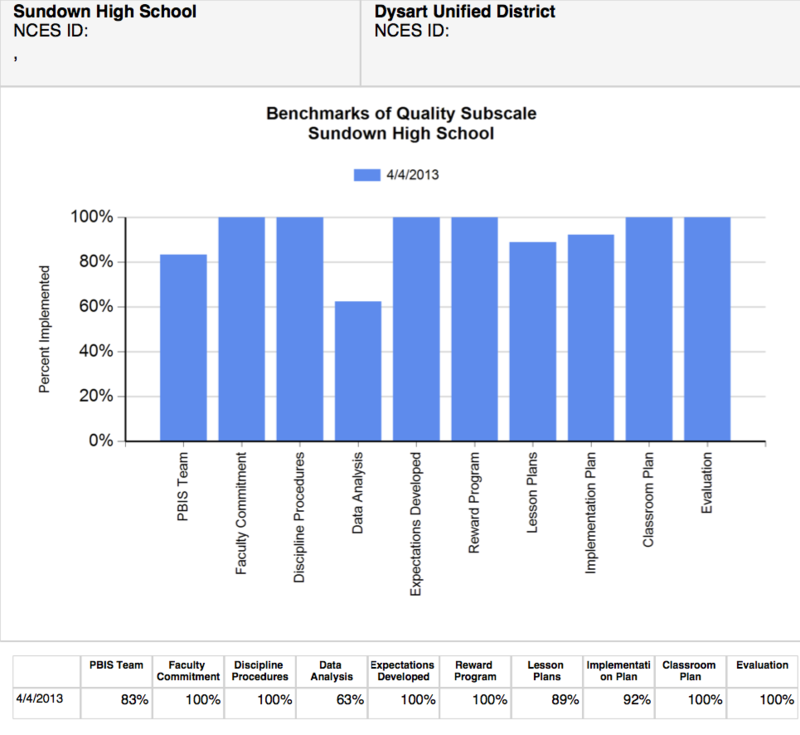 Dysart Unified School District: Sundown Mountain Alternative ProgramPrincipal: Jim Grieshaber Sundown Mountain is the alternative program for high school students in the Dysart Unified School District. Students are referred to Sundown from the 4 high schools in the district primarily for credit recovery and because the traditional setting was not working for them. We service 10th-12th graders and many second year seniors. 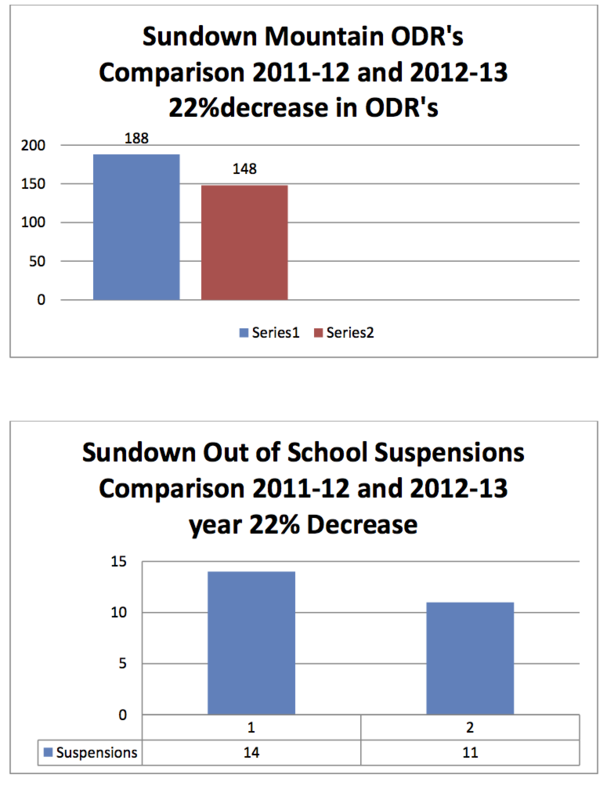 Since the implementation of PBIS and the Tier 2/3 interventions of Check in, Check out, Student Assistance Program (SAP) and Individualized behavior plans, Sundown has seen a decrease in problem behaviors that were interfering with the learning environment and an increase in attendance and school connectedness. The climate at Sundown has become one of caring, acceptance of diversity and order. The 3R’s of Respect, Responsibility and Ready clearly define Sundown’s expectations. SAP groups have allowed for friendships to be created where one didn’t before exist because students previously had failed to see the commonality they had with students that appeared different from themselves. PBIS family information workshops have brought an astounding number of parents to these evening events to learn more about the successes occurring at Sundown through PBIS. Staff and students have made a commitment to this system-wide change which is evident in the data provided below. 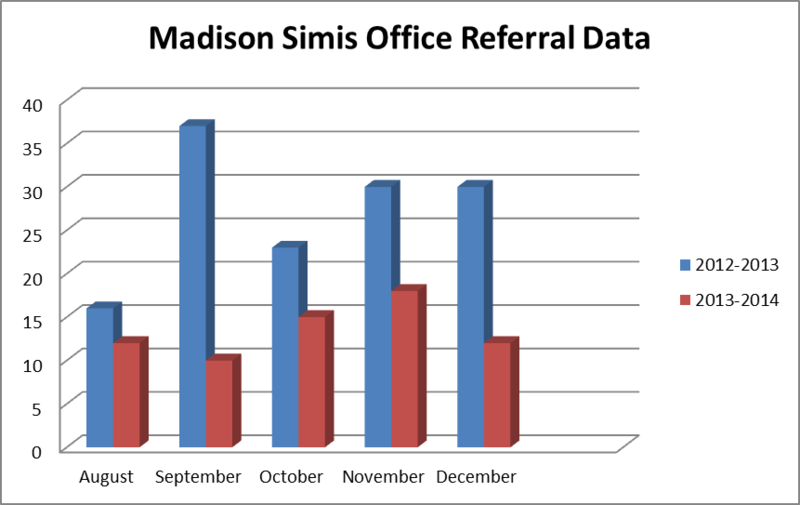 Madison Elementary School District: Simis SchoolPrincipal: Dr. Joyce Flowers PBIS has made an impact at Madison Simis Elementary by helping us create specific school wide expectations and an acknowledgement system which helps promote positive student behavior. Expectations are taught, modeled, and practiced by teachers and students. Students who exhibit our expectations are then acknowledged by staff members. Students are excited to earn “loops” for showing our school-wide expectations and they enjoy having teachers catch them being respectful, responsible, and safe.We have been utilizing pieces of the PBIS system for several years but it wasn’t until we began keeping track of our data using SWIS, 2 years ago, that we were able to really see a change. Sharing data with our staff (and now our students) has increased fidelity to our system and has given everyone a feeling of ownership in the process.The last 2 years we noticed some trends in the data (spikes in November) however the overall number of ODRs has decreased.In addition to ODRs, our staff uses Minor Incident Reports (MIRs) for teacher managed behavior which helps reduce problem behaviors before they have a chance to escalate.PBIS has helped make Simis a place for extraordinary learning for all! Mesa Public Schools: Riverview High SchoolPrincipal: Paul Ruiz In its first year of PBIS implementation, Riverview reduced the number of office referrals, with only 820 ODR’s at the end of the year. 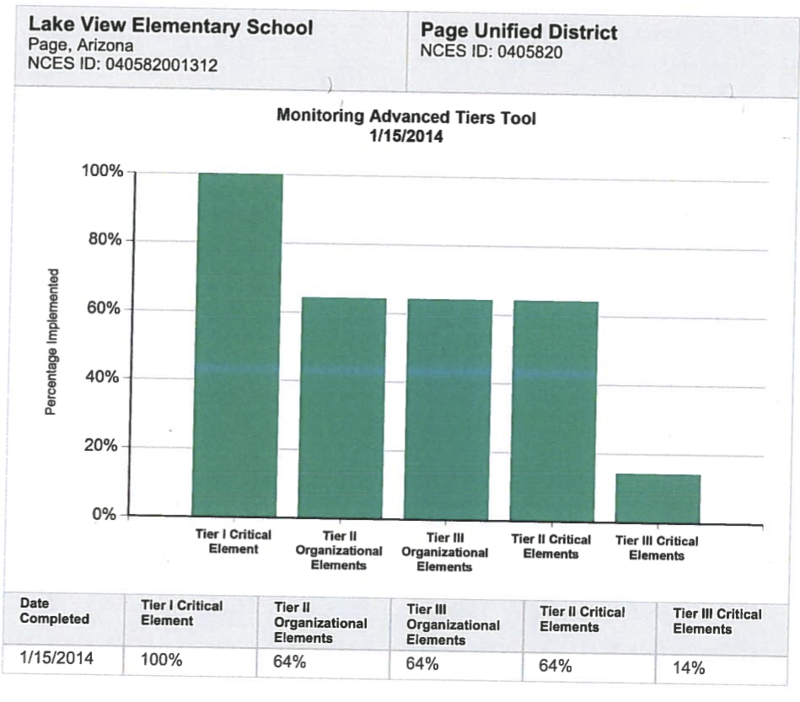 This 53 percent reduction in referrals for student behaviors was not the only success. 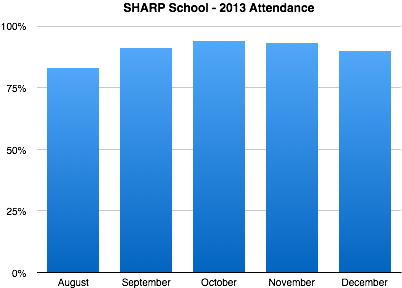 Attendance increased from 69% in 2011-2012 to 81% in the 2012-2013 school year. The number of students who successfully transitioned back to their referring schools also significantly increased. Mesa Public Schools: SHARP Alternative ProgramPrincipal: Leilani Scott SHARP School is a specialized public K-12 school, servicing students with disabilities that also exhibit significant behavioral challenges. SHARP is considered the most restrictive educational setting for students to best meet their needs.SHARP began the PBIS foundation last year, meeting with KOI and developing a TIER 1 framework. SHARP implemented PBIS Tier 1 this year and have seen positive results and changes school wide.Students have embraced PBIS and the positive changes that faculty has made. There is no longer a punitive based system but instead, students recognize that staff is make the effort to change THEIR practices to positively impact and modify students behaviors.Students love getting their tickets!!!!! Tickets are then turned into reward money that allow students to purchase items from our school store. Names are drawn and students and staff are recognized weekly, with quarterly and semester drawings.Prior to PBIS, many staff members felt unsafe on campus. With PBIS, staff feel safer and recognize a change in the culture and climate of the school.Major behaviors are beginning to decline. 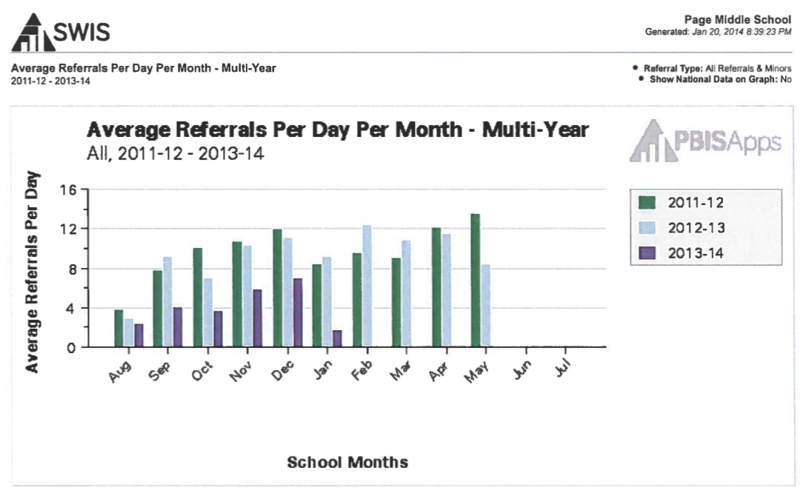 At the first of the year, SHARP averaged 44 Office discipline referrals a month. December’s total was 33. This is significant as compared to last years average of 60 ODR’s a month.We LOVE PBIS!!!!!!! It makes teachers and students better! Madison Elementary School District: Camelview Elementary SchoolPrincipal: Mike Winters The PBIS philosophy has been a significant part of Camelview’s positive culture. 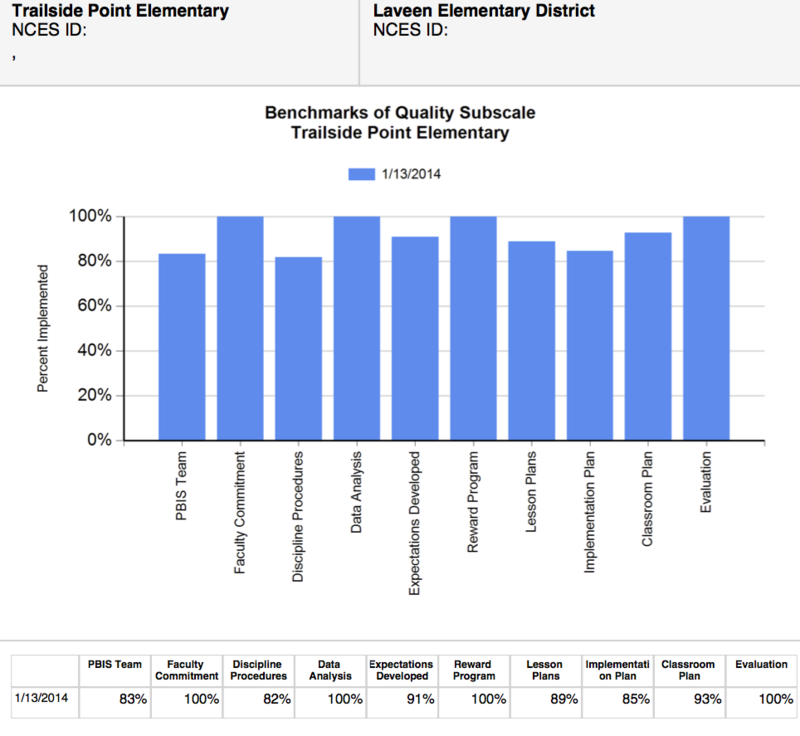 The PBIS Team proactively uses data to support student success socially and academically. Students are taught and reminded of best practices to increase their chances of success throughout our campus. Positive incentives are linked to these actions for students and staff and our school data (50% reduction in Office Referrals and a 100% increase in Positive Referrals) has demonstrated its success for a sustained culture. 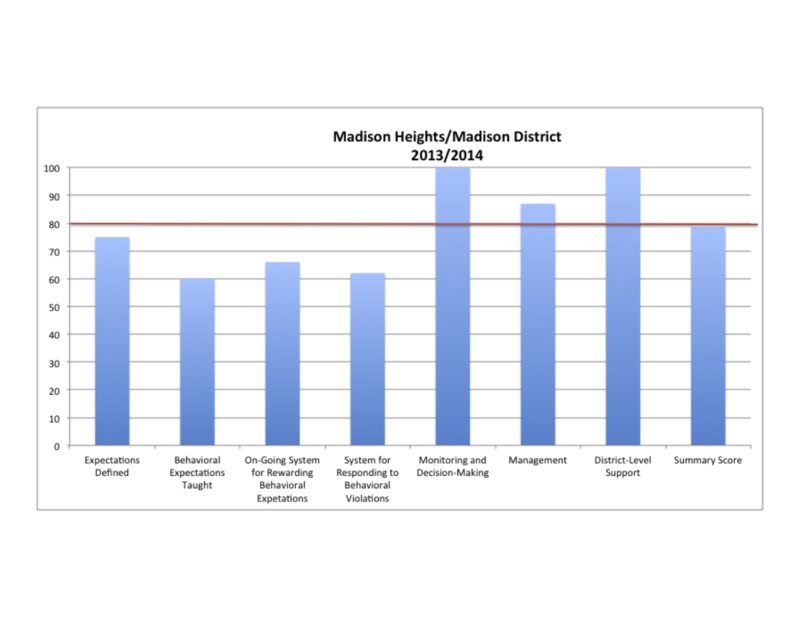 Madison Elementary School District: Heights SchoolPrincipal: Priscilla Gossett Implementing PBIS at Madison Heights has had a profound impact on the way we look at student behavior. Teachers are becoming more consistent in their expectations of students, raising the bar for the way children are at school. 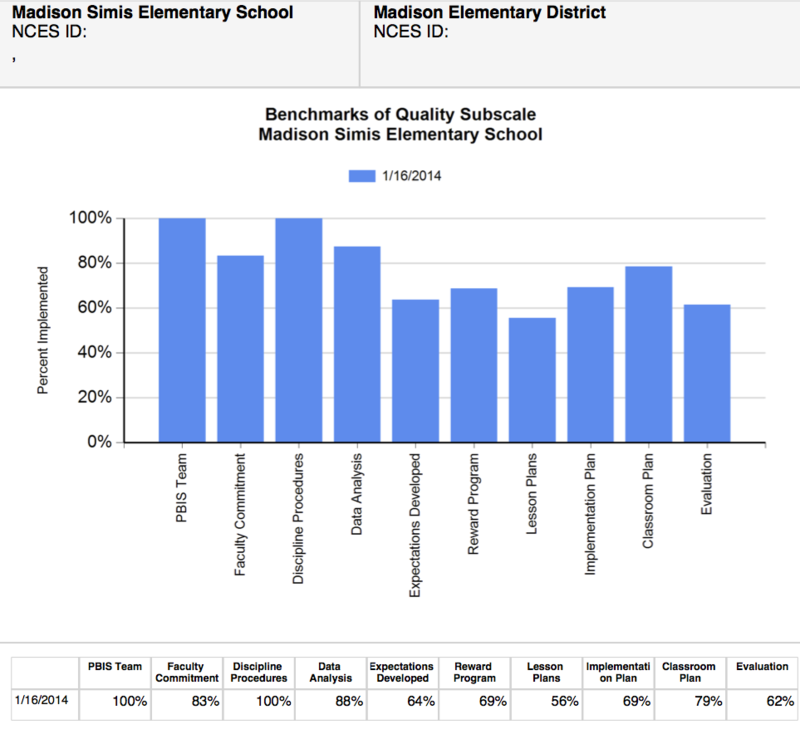 Our PBIS team has used the SWIS data to focus our efforts in improving the school culture, through identifying areas needing more resources and practices that can improve behavior results. Teachers are able to spend more time teaching academics once the student behavior expectations are in place. Parents have commented on our culture of positive reinforcement and the happiness their child experiences at school. 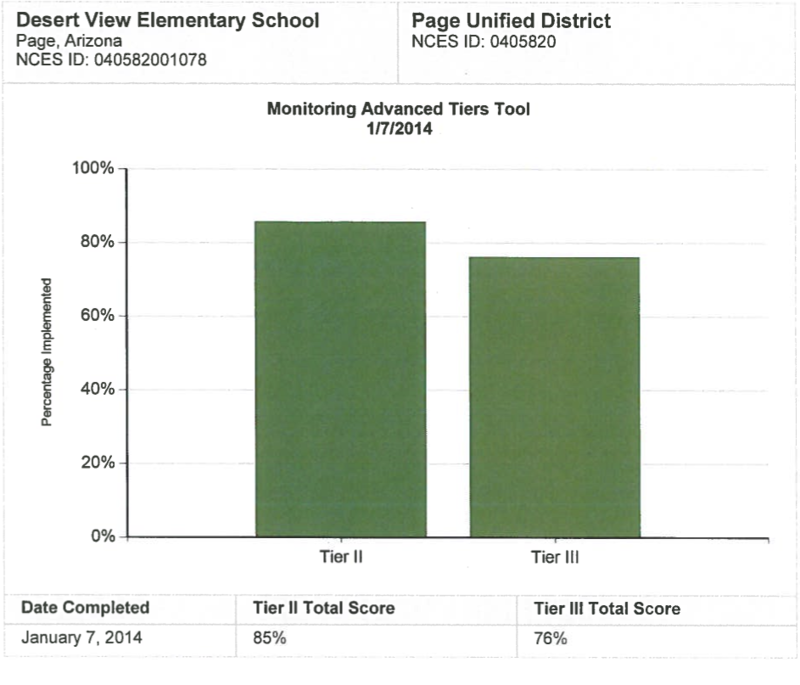 We cannot wait to continue our growth and development in implementing PBIS, and in turn seeing our students excel. Madison Elementary School District: Park Middle SchoolPrincipal: Todd Stevens Madison Park Middle School recognizes positive behavior through teaching the expectations of ROAR through Respect, Outreach, Achievement & Responsible. The school’s program, ROAR, has had a huge impact on the climate of the school. 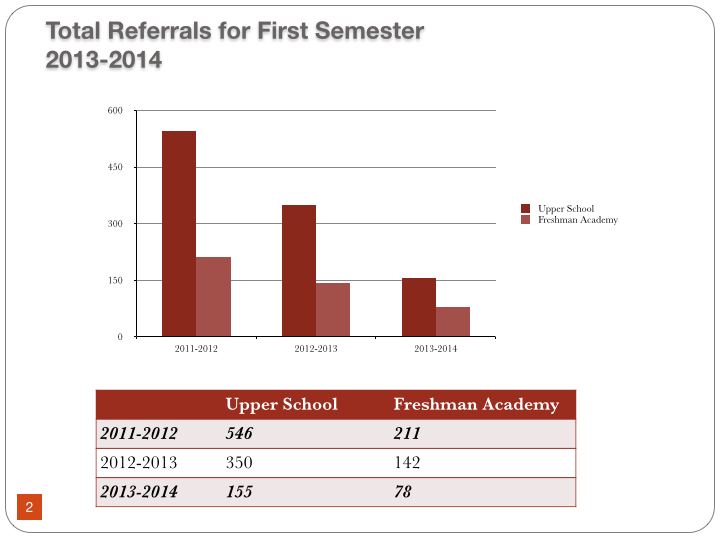 During the first semester, the number of referrals has decreased from 313 to 140, school wide. Each month, Madison Park hosts grade level assemblies where the administration takes the opportunity to show students and staff the monthly referral data and reteach expectations. At the assembly, students are also recognized for each component within ROAR and are given a certificate and a fun brag tag that they get to wear as a symbol of being a leader on campus. Students are rewarded for following the expectations by earning ROAR stickers on a chart. Completed rows of stickers allow students to pick a prize of their choice that was established by the student community. During the first semester we also saw our academic scores for the MAP assessment show a very large increase in student growth which we also attribute to our focus in the Achievement in ROAR. Marana Unified School District: Marana High SchoolPrincipal: Dr. Allison Murphy PBIS has been active in Marana High School for many years. It has created a universal understanding among staff members and provides powerful opportunities to change behavior by teaching behaviors and creating positive relationships between adults and students. PBIS is not just a program at our school; it is part of our school culture. Our students have embraced school wide expectations and contribute to regulating by encouraging each other to make better decisions. Our students also give their teachers and staff positive incentive cards which have created more positive interactions between students and adults. As a result of many years of dedication to the fidelity and continuation of PBIS, our school has experienced decreasing referrals and an increase of TOP TIGERS which are students with a 3.5 GPA or higher. Our PBIS team will continue to strategically make data driven decisions for interventions so to have the greatest impact in the everyday lives of students and maintain a PBIS culture on our campus. 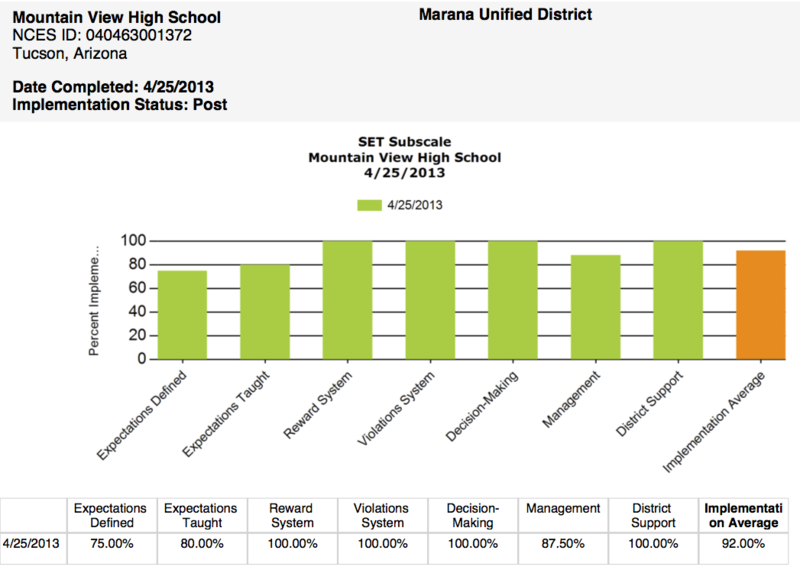 Marana Unified School District: Mountain View High SchoolPrincipal: Patricia Cadigan The tier 1 PBIS principles that have been implemented this school year at Mountain View High School have made a strong impact on our students and staff. Our teachers have embraced PBIS as a research-based system that produces effective results. We have assembled a PBIS team that includes administrators, teachers, counselors and other staff members. Their role is to assess the PBIS systems on our campus, review data and train teachers on best practices. Our district has also assembled a district-wide PBIS team that meets monthly to discuss our practices and share ideas. Currently, we are conducting SET evaluations at each school in our district in order to raise awareness of PBIS initiatives and ensure that each school in our district is implementing PBIS with fidelity.Our school-wide expectations stem from our school motto, which is “Do the Right Thing”. This motto operationalizes our expectations into many different contexts. This year, our rewards for “Do the Right Thing” have expanded to include drawings for prizes such as Beats headphones and even an iPad mini. The students also appreciate the opportunity to win a free yearbook, tickets to the school’s athletic events and Winter Formal. Our PBIS rewards program encourages teachers to recognize positive behavior and reinforce it with our students. Our PBIS video has raised awareness of our motto and PBIS principles. IT was shown to the 8th graders at our feeder middle school to show them our school culture as they begin their transition to our campus. This has created some excitement and encouragement to “Do the Right Thing.”Built into our master schedule is a research-based program called “Instructional Intervention”. This class is assigned to every student. It is a period during the day in which students can work on assignments and get help from teachers, re-take quizzes or tests and receive instruction on social skills and PBIS principles. We are also piloting a peer-tutoring and teacher/student mentoring program in order to address failure rates in Math. 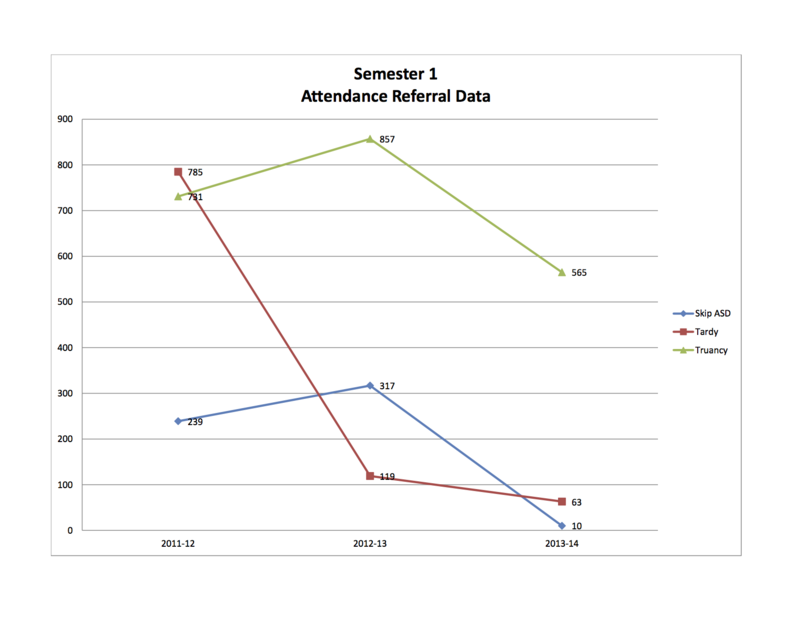 These academic interventions have shown promise as we fine tune our RTI systems.The data for this school year has shown a significant decrease in the total number of office disciplinary referrals compared to last year. Specifically, we have seen a decrease in substance abuse violations on our campus. We attribute this success not only to teachers but to our students who are recognizing the importance of “Doing the Right Thing” in their daily lives. Our teachers are to be commended for taking a positive approach with students, teaching/modeling the appropriate behaviors and reinforcing positive behaviors with rewards. We will continue to work on our multi-tiered systems of support for the rest of the school year. Our goal is to shift our focus to tier 2 interventions to ensure we are addressing our students’ needs comprehensively. Paradise Valley Unified School District: Fireside Elementary SchoolPrincipal: Dr. Drew Davis Fireside students proudly shine with the “SPARK” of Excellence. Safe, Positive, Appropriate, Responsible, and Kind behavior is expected from our students, campus wide. Our Matrix is taught throughout the year to students and available to parents who may support our efforts by using common language at home. A PBIS committee, with an all grade level representation and participation, consistently studies data. 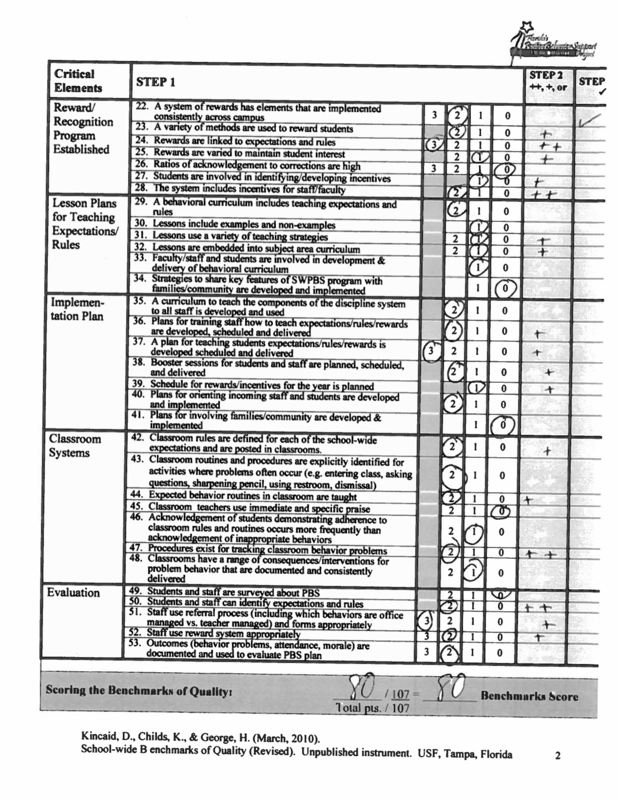 Fireside is proud to report high academic scores with low disciplinary concerns. Sunnyside Unified School District: Desert View High SchoolPrincipal: Jose Gastelum PBIS has been the genesis of tangible positive outcomes for students. Universally, our Jaguar scratch program and raffles provide teachers multiple daily opportunities to reward students for behaving correctly. Our use of the Learning Earning program provides another way to enhance academic engagement. Our Student Assistance program has served as a targeted outreach to hundreds of students who have not only developed a deeper support system, but have demonstrated increased performance in the classroom and much higher connectivity to the school community. PBIS has resulted in much more student leadership. Our students designed and led tolerance , anti-bullying and kindness campaign that drew the participation of hundreds of students and seem to have enough traction to become yearly events. The BARR curriculum and TND curriculum have helped bring structure and relevance to our detention and home room programs. 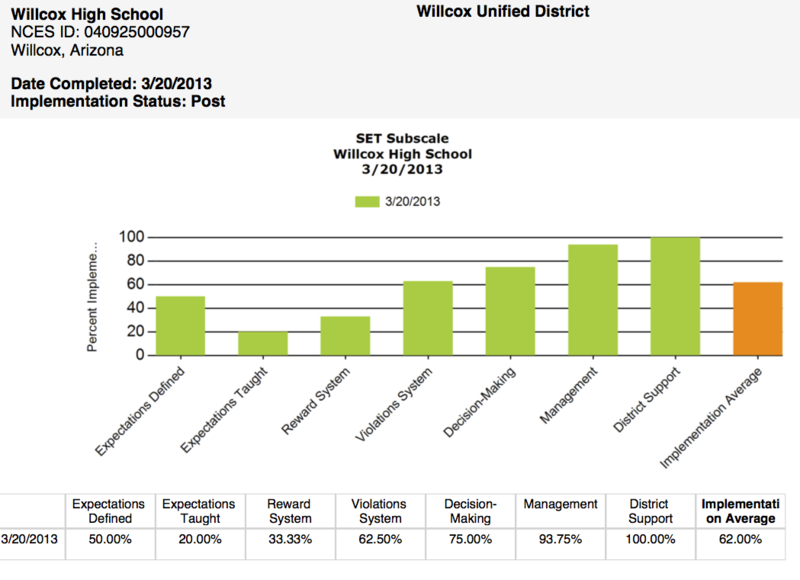 Wilcox Unified School District: Wilcox High SchoolPrincipal: Jeff Thompson Willcox High School has seen amazing changes in our students in the last two years with the implementation of PBIS. There is a new since of pride for our campus. We see students go that extra few steps to put their trash in the can, rather than on the ground. We see students reminding each other that we want to take care of our campus. In the hall ways we can often hear students congratulating their fellow students on a job well done. The attitude of the students and staff has become much more supportive of each other. Staff is more relaxed and less stressed because students are calmer, happier, less combative and more compliant to the rules.